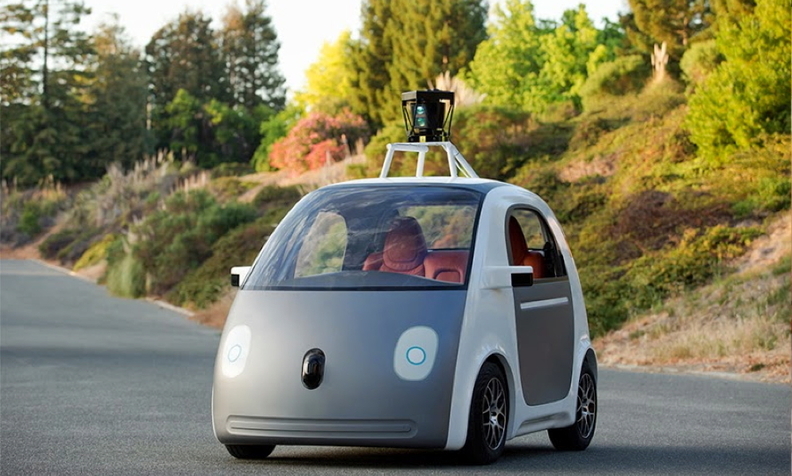 The Google prototypes are small pod-shaped cars that appear to be the size of a Smart ForTwo. Google will launch its own fleet of autonomous vehicle prototypes – with no steering wheels and no gas or brake pedals – as the technology giant begins a new phase of its self-driving car project. Google designed the car and plans to have about 100 test vehicles that are fully autonomous with extra safety features, company co-founder Sergey Brin said during a conference Tuesday hosted by technology blog Re/code in Rancho Palos Verdes, California. The New York Times reported Tuesday night that a Detroit-area manufacturer is building the cars for Google, which declined to name the manufacturer, according to the Times’ story. In an announcement posted to the company’s blog late Tuesday, Google says it will begin testing the prototypes this summer. Early versions will include manual vehicle controls and will be tested by company “safety drivers,” Google said. A small pilot program in California may follow “in the next couple of years” if steady progress is made on the project, Chris Urmson, director of Google’s self-driving car project, wrote in the blog post. By building its own prototypes, Google is entering a new chapter in its ambitious autonomous vehicle project, bringing the deep-pocketed tech giant closer to established automakers such as Volvo Car Corp. and Nissan Motor Corp. that have pledged to put fully autonomous vehicles on the road by the end of the decade. Google has been developing self-driving vehicle technology since 2009, using a fleet of test vehicles equipped with sensors, lasers, radar and computers that process mapping and drive software to allow their vehicles to be driven autonomously. Google says its test fleet has racked up some 700,000 miles of autonomous driving during so far. The Google prototypes are small pod-shaped cars that appear to be the size of a Smart ForTwo with two seats and two doors. The cars don’t have steering wheels, brake pedals or accelerator pedals “because they don’t need them. Our software and sensors do all the work,” Urmson wrote in the company’s blog post. The prototypes, which have safety items such as additional foam at the bumper and a plastic-like windshield, are part of the company's research laboratory called Google X, which is led by Brin. "We took a look from the ground up as to what it would be like if we had self-driving cars in the world," Brin said. "We've worked with partners in the Detroit area, Germany and California," he said without giving specifics. The prototypes let users ask for a destination address and then drives them to it, Brin said. The cars are powered by an electric motor and have a top-speed limited to 25 mph. In its post, Google did not say whether the cars were based on an existing platform from an established automaker. Some automakers have recently introduced vehicles equipped with advanced safety technologies that provide limited levels of autonomous driving. The Acura RLX flagship sedan, for example, can drive on the highway without steering input from the driver for short periods. The car’s adaptive cruise control maintains a constant speed and safe distance between cars and objects on the road ahead while a lane-keeping system prevents the car from drifting out of its lane, but only for a few seconds before warning the driver to return his hands to the wheel. In an interview with the Times, Brin said those kind od advancements didn’t measure up to Google’s ambitious goals for its autonomous car project. “That stuff seems not entirely in keeping with our mission of being transformative,” Brin told the Times. Over the next two decades, self-driving cars are going to get a bigger share of the market. Such vehicles will reach 11.8 million in 2035, according to Egil Juliussen, an analyst at IHS Automotive. And by 2050, he expects almost all cars to become self-driving. They are estimated to fetch premiums that will start at $7,000 to $10,000 in 2025, he said. Brin said the Google vehicle is still being worked on at this point. "It's still early," he said. "We're still doing lots of development with the software, the hardware and the experience."